This is an artificial, fly and spin fishing tournament. Only flats skiff type boats with a poling tower may be used. Flats skiff type boats exceeding 20-ft. in length are not permitted. Licensed guides may fish as anglers. Prior to the start of the tournament the designation of the angler(s) must be made. There cannot be any substitutes once the tournament begins. There will be no other persons on the boat besides registered anglers and guides unless pre-authorized by the tournament committee. Only the angler may touch the rod, reel or line while the line is outside the boat. The only exception is when landing a fish the guide may touch the line but no more than the length of the rod to the hook. Anglers and Guides may begin fishing any time during daylight tournament hours of each of the two days of fishing but may not exceed 8- hours each day on the water dock to dock. Fish must be measured from tip of nose to tail. A photo must be taken of the whole fish on the Rapala ruler we have provided. Place the nose of the fish against the upright hinged end of the ruler and take a clear photo of the entire fish on the device. Anglers may measure all fish (Fly and Spin). Minimum length for scoring is 24”. Scoring in each division will be based on largest three (3) fish per day, caught on fly or spin tackle. Individual anglers are allowed to score up to three fish in a division per day. Fish from day one may not be counted on day two. Please record all releases regardless of size. There is a place on your score sheet to track smaller fish you do not wish to measure. Fish are scored individually by division and may not be combined. Six fish can be scored per angler, per division. Qualifiers for the Ben Gravett Team Division must have a boat with two anglers and a guide/captain (Three persons total). Scoring for the Team Division is based on measuring up to 3 fish per day, per angler (12 fish total combined for 2 anglers over the course of the tournament). Fishing range is unlimited and boats do not have to report in the morning to Hurricane Hole Marina prior to fishing. Anglers and Guides must return to Hurricane Hole Marina by no later than 5:30 PM by any means possible with their score sheet and photos. Anglers and Guides unable to return to the dock by 5:30 PM will not be eligible for scoring on that day. Unforeseen circumstances (mechanical) must be reported by 5:00 PM to the tournament committee (Loren Rea 305-360-6969) in order to be considered for scoring. A digital camera or smart phone with camera must be provided by the angler and/or guide. A photograph of the entire fish on the Rapala ruler must be shown to the scorekeeper. There is a 24- inch minimum measurement for scoring. Please keep track of all barracuda releases regardless of size. Daily catch forms must be returned to the scorekeeper by the angler and/or guide at the end of each fishing day along with a photo of fish caught. 20# max tippet for all light tackle and fly leaders. If a rod is broken while fighting a fish the fish may still be landed and submitted for scoring. Barracuda may be cast to in water less than 8- feet deep. 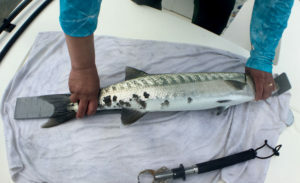 The barracuda must be on the edge of a flat or on the flat, but not in a channel. Barracuda fishing on natural structure is allowed as long as that structure is in no more than 8- feet of water. No wreck fishing is allowed. All protests should be submitted in written form to the tournament rules committee by 5:30 PM the day the proposed infraction occurred. Ties shall be broken by the time of the last fish caught first. In other words if two anglers result in the same score at the end of the fishing day, whomever caught their fish earlier in that day would prevail (Please record time your fish is landed). The tournament director reserves the right to refuse tournament entry to any prospective entrant with or without cause at his, her or their sole discretion. For purpose of these rules the tournament is held at Hurricane Hole Marina on Stock Island. Each winning angler and guide will give one $50 gift certificate towards buying a round for the tournament participants.